Shri Desai was detained in the individual Satyagraha launched by Mahatma Gandhi, released in October, 1941 and detained again in August, 1942 at the time of the Quit India Movement. He was released in 1945. After the elections to the State Assemblies in 1946, he became the Minister for Home and Revenue in Bombay. During his tenure, Shri Desai launched a number of far-reaching reforms in land revenue by providing security tenancy rights leading to the 'land to the tiller' proposition. In police administration, he pulled down the barrier between the people and the police, and the police administration was made more responsive to the needs of the people in the protection of life and property. In 1952, he became the Chief Minister of Bombay. According to him, unless the poor and the under privileged living in villages and towns enjoy a decent standard of life, the talk of socialism will not have much meaning. Shri Desai gave concrete expression to his anxiety by enacting progressive legislations to ameliorate to the hardships of peasants and tenants. In this, Shri Desai's Government was far ahead of any other State in the country. And what was more, he implemented the legislation with an unswerving sincerity earning wide reputation for his administration in Bombay. In 1967, Shri Desai joined Smt. Indira Gandhi's cabinet as Deputy Prime Minister and Minister in charge of Finance. In July, 1969, Smt. Gandhi took away the Finance portfolio from him. While Shri Desai conceded that the Prime Minister has the prerogative to change the portfolios of colleagues, he felt that his self-respect had been hurt as even the common courtesy of consulting him had not shown by Smt. Gandhi. He, therefore, felt he had no alternative but to resign as Deputy Prime Minister of India. 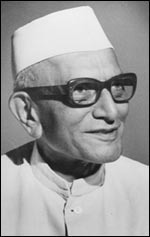 When the Congress Party split in 1969, Shri Desai remained with the Organisation Congress. He continued to take a leading part the opposition. He was re-elected to Parliament in 1971. In 1975, he went on an indefinite fast on the question of holding elections to the Gujarat Assembly which had been dissolved. As a result of his fast, elections were held in June, 1975. The Janata Front formed by the four opposition parties and Independents supported by it, secured an absolute majority in the new House. After the judgement of the Allahabad High Court declaring Smt. Gandhi's election to the Lok Sabha null and void, Shri Desai felt that in keeping with democratic principles, Smt. Gandhi should have submitted her resignation. For him, truth was an article of faith and not an expediency. He seldom allowed his principles to be subordinated to the exigencies of the situation. Even in the most trying circumstances, he stood by his convictions. As he himself observed, 'one should act in life according to truth and one's faith'.